The main front of the Jesuit College (click to enlarge the picture). 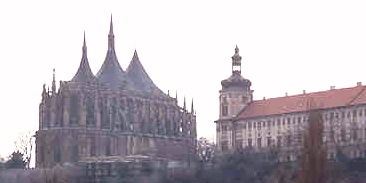 A skyline of the St.Barbara Cathedral and of the Jesuit College (click to enlarge the picture). A silhouette of the Cathedral and of the western part of the Jesuit College. Night view of the Cathedral and of the western tower of the Jesuit College (click to enlarge the picture). Other pictures of Kutna Hora here. Other info available on the website of Kutna Hora.